With this new bowrider, no one needs to know how little you spent. 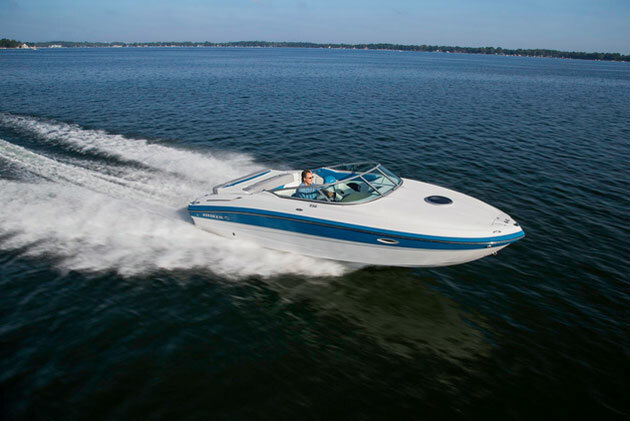 With boats like the Rinker Captiva 200 MTX being introduced, you have to love the current trend in the marine market toward smaller, lighter, and most importantly, more affordable boats. That’s one positive thing to come from the enduring economic malaise. Who says fun has to cost a ton of money? 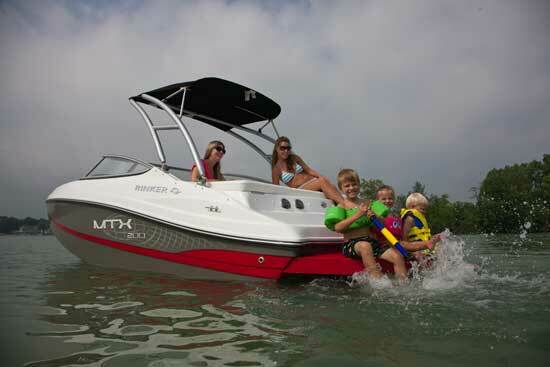 The Rinker Captiva 200 MTX costs less than you'd think - and plenty of laughter is included. Truth be told, the marine market had succumbed to the same excesses that ushered in the current housing market. A few years ago, every boatbuilder you talked to was building bigger and bigger models. They were more profitable than smaller models, and credit flowed like box wine at a redneck wedding—so why not capitalize on it? The spillover was that nearly all models were getting too expensive, even those deemed entry level. 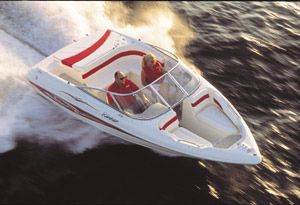 Only the largest companies with the greatest economies of scale, Bayliner for example, were still offering models for buyers that either didn't have a tremendous amount of discretionary income or were smart enough not to pull equity out of their home to buy a depreciating asset. 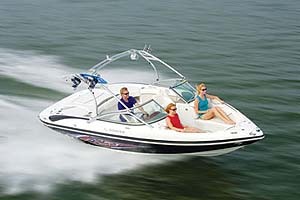 That probably helped bring about the Rinker Captiva 200 MTX. The look-at-me price is listed “as low as $22,999,” which usually makes you look for the asterisk and squint at the fine print. The asterisk in this ad is that the price does not include freight, prep, taxes or a trailer. Five years ago, you’d swear a boat that looked like this would have cost $35,999. So either boatbuilders have learned how to make them for less, or they were hammering consumers on price back then. 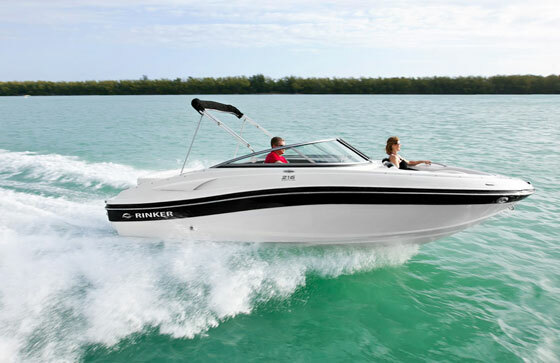 For that price you can get a basic boat with a 135-horsepower fuel-injected MerCruiser 3.0 four-cylinder and an Alpha One stern drive. The standard engine is ample for pushing around the 2,700-plus pound boat, and it’s easier on fuel than the optional 220-horsepower V6. 135 standard horses provide plenty of pep - and lower fuel bills, as well. 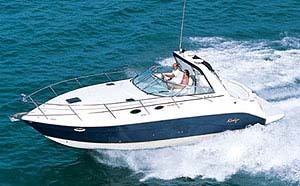 One of the big draws of the Captiva 200 MTX lies in the design itself. For example, it features the wide-open bow afforded by a pickle-fork design, which means it carries a lot of its eight foot beam ahead of its windshield. That means wider cushions all the way around and more cavernous stowage underneath. It’s also neat that Rinker tucked the grab handles beneath the gunwale, so as to maintain the boat’s clean profile. Hullsides come in seven standard colors, with some custom hues available for an up-charge. 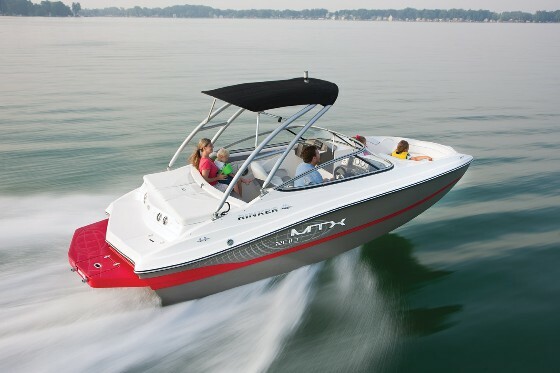 The tower is optional, but a ski tow eye comes standard on the transom, as well as a portable cooler in its own enclosure, and an in-sole locker long and wide enough for wakeboards. The interior reflects either the boat’s price or Rinker’s tasteful restraint in design. Either way it’s done well, with LED cockpit lighting, lots of cupholders, and one-tone accents for the white vinyl upholstery. The instrument cluster is simple and straightforward, molded as a module and fastened to the one-piece deck and hull liner. The white-face gauges look right at home and provide tasteful contrast to the faux-engine-turned dash appliqué panels. Add an Isotta steering wheel and the overall package has a first-rate look and feel, for a value-leading boat. The recession may have caused some of the weaker boat companies disappear, but it also made some boatbuilders better. 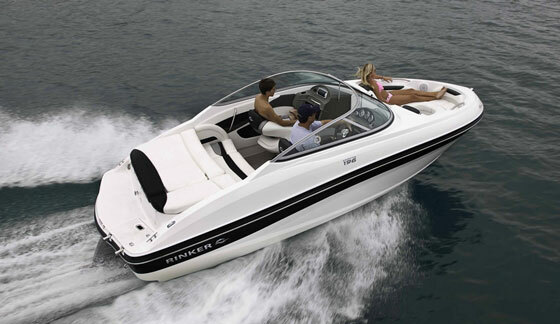 Rinker is among the latter, and the Captiva 200 MTX is one of the best examples why. 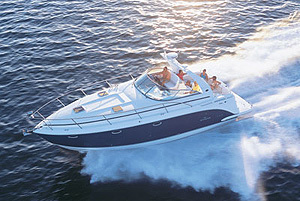 For more information, visit Rinker Boats.